Enjoy ultimate relaxation in our Marina View Three Bedroom Suite, mixing cozy and convenient amenities and accommodations for a perfect stay. This suite includes one king, one queen and two full beds, and one full sleeper sofa in the living area. The suite also features two baths with a garden tub, a fully-equipped kitchen, dishwasher, and washer and dryer to make your stay stress-free. 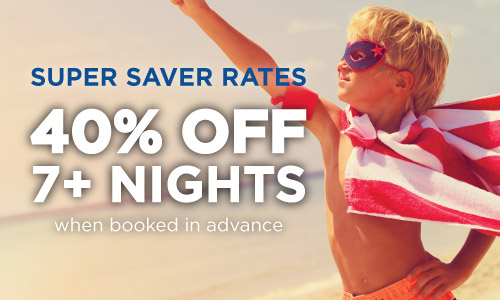 Save 40% off 7 night stays or longer when you book at least 7 days in advance! Save 35% off 5-6 night stays when you book at least 7 days in advance! Boasting a full service marina, water sports, inviting accommodations and friendly service, Harbourgate Marina Club ranks top among North Myrtle Beach SC hotels. Perfect for groups, families, and couples, this Grand Strand hotel offers easy access to the many nearby attractions such as dining, entertainment, shopping and more. Love North Myrtle Beach? Be in-the-know with early access to our best offers and exclusive deals right in your inbox. Sign up today!